James Foley was many things to many people. Son, friend, teacher, colleague, and reporter are only some of the labels that could describe him. Born in Evanston, Foley’s family moved to New Hampshire when he was a young child. After high school, he returned to the Midwest and attended Marquette University in Milwaukee. From there, he completed a teaching stint for Teach For America, attended the University of Massachusetts and moved to Chicago, where he lived in Pilsen while teaching juveniles at the Cook County Boot Camp and attending Northwestern’s Medill School of Journalism. To the public, James Foley is mostly known as the freelance reporter held captive in Syria from Thanksgiving 2012 until he was brutally murdered two years later by ISIS in a video that went viral and in many ways introduced the West to the evils that is ISIS. And although he was a victim, his friends are determined to make sure the narrative about his life is much more than about a victim of terror. They have done so with a new film about the many facets about him in “Jim: The James Foley Story” which premieres tonight on HBO. The film premiered last month at the Sundance Film Festival where it won the audience award for Best American Documentary. Directed by Foley’s childhood friend Brian Oakes, another member of the film’s crew who knew Foley is co-writer Heather MacDonald, who first met Jim in junior high in Wolfeboro, New Hampshire. On the day of the HBO premiere, The Chicago Ambassador caught up with MacDonald, who currently lives in Boston. CA) You were personal friends with Jim, correct? MACDONALD) Yes, Brian [Oakes] and I went to school with him in New Hampshire. Brian went to primary school with him and I went to junior high and high school with him. CA) Is writing for film your background? MACDONALD) I have a playwriting background. When Brian wanted to do this film, he approached me and I naturally said yes. CA) Was there any concern that being personal friends with Jim would pose any difficulties in telling his story? MACDONALD) It didn’t necessarily pose any difficulties. It certainly imbued the whole project with a much more personal and emotional perspective, which is useful. There were other folks on the creative team that did not know Jim so it ended up being a really nice balance. CA) You are one of three co-writers of the film, along with Brian Oakes who directed it, and Chris Chuang, who also is an associate producer. Did Chris know Jim? MACDONALD) No, he did not. CA) From everything I’ve read, one of the main goals you all had was to take control of the narrative of Jim’s life. MACDONALD) We knew that somebody would be interested in the story and we thought that we had an interesting perspective and could handle it with delicacy and honesty and that real personal affection that we had for Jim. In terms of the narrative, we didn’t want anyone to tell the story in a way that would sensationalize his death or his life, especially given that image that people have of him. We wanted to reframe it. CA) The film notes early on that the execution video of Jim is NOT in the movie. Why was the choice not to include it so important? MACDONALD) A couple of reasons. One, the film is not really about his death to us. It is about his life so we didn’t want to spend the time on his death. Two, we also think that people should have the option to see that image or not, and we count ourselves in the group that doesn’t want to see that image. CA) It made its world premiere at the Sundance Film Festival last month, correct? MACDONALD) Yes, just a couple weeks ago. CA) It won the audience award. What was that experience like? MACDONALD) Yes, it was really fantastic. It won the audience award for best U.S. documentary. We were really moved to know that the people who saw the film loved it. Jim’s parents were there also and came on stage with us to receive the award, so that was special as well. CA) Many people may have forgotten that Jim was kidnapped in Syria on Thanksgiving 2012 and held captive for 2 years before being killed by ISIS. And before that, he was held captive in Libya for 44 days. Knowing Jim, what do you think the fact that Jim returned to what most consider a danger zone after being held captive in another dangerous place tell us about him? MACDONALD) That was one of our questions, one of the central questions of the film. Why did he go back? What drove him to go back? We learned through a lot of conversations with people really how committed he was to tell the stories of these people that otherwise would not be told and also to tell the world about their plight, which has only gotten worse for the Syrian people. He was there years ago when it first started happening and was trying to get the story out. For him, it was beyond himself. He had that humanitarian side to him, and he was restless. A 9-to-5 desk job would not have interested Jim. MACDONALD) Absolutely. That was very important to us. We don’t want his image and story to be sensationalized and on the flip side, we don’t want to make a hero out of him. We just want to show that he was a good man and that he lived that way and died that way. CA) To summarize, why is the film important? MACDONALD) We think it’s important because we want to take the image of Jim back from people who would use it for purposes of propaganda. We want to show the story of the man behind the image and we are really proud of what we’ve done and hope the audience will respond. 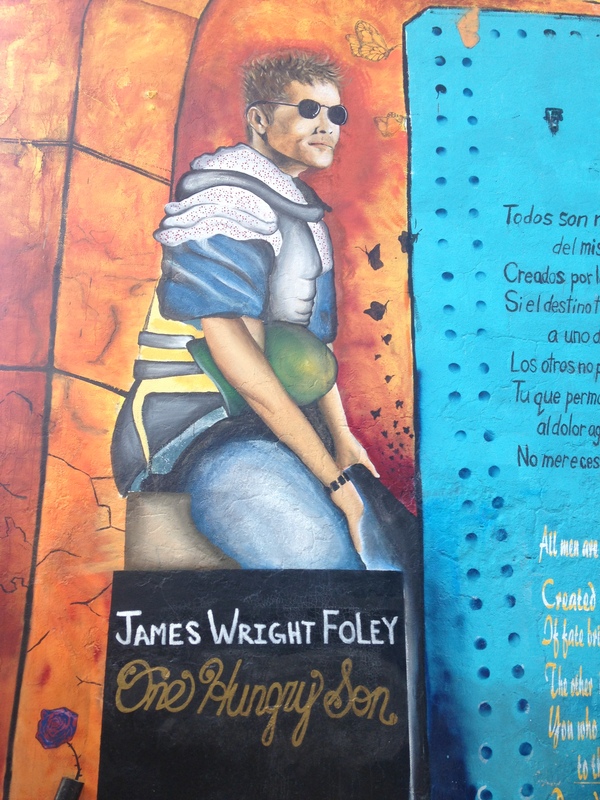 A mural of James Foley on the 1400 block of West 18th Street in the Pilsen neighborhood of Chicago. 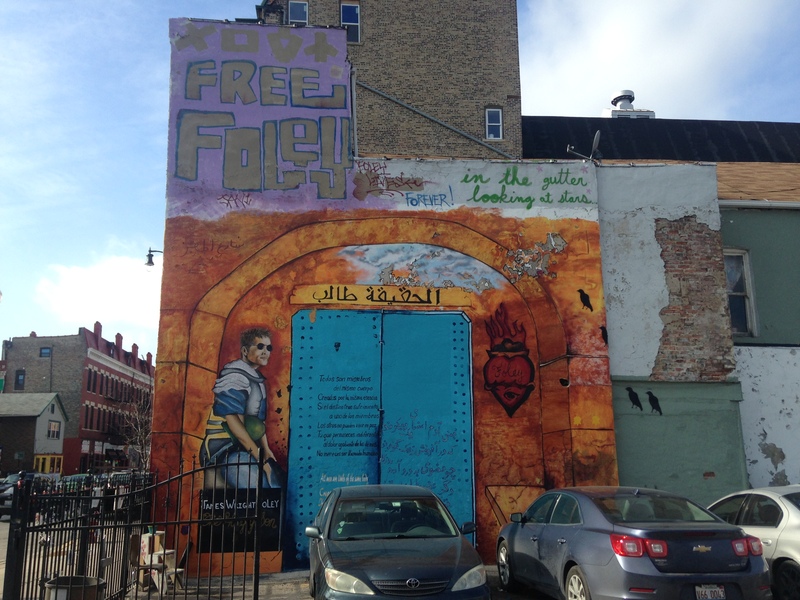 To the right of the image of Foley, in Arabic, Spanish and English it reads: All man are limbs of the same body created from one. If fate brings suffering to one limb, the other limbs cannot remain at peace. You who remain indifferent to the burden of pain of others do not deserve to be called human.